Candidates Jorg Dubin, Judie Mancuso, Peter Blake, Toni Iseman, Sue Kempf, Allison Mathews, Cheryl Kinsman, Paul Merritt, Lorene Laguna, and Ann Christoph were given anywhere from 15 seconds to two minutes to answer questions at the Stu News/KX 93.5 Forum. The forum was broadcast on the local station and posted on the Stu News Facebook page. For those who missed it, here is Part Two (Part Three will run on Tuesday). Iseman: “What you see if you study this budget is a gradual increase of money coming into the community, and you also see places where it holds still. It holds still when the economy gets soft and when the real estate market gets soft, that’s what generates so much of what we have. And every time a house turns over, someone buys it and it’s valued at the price that was determined when it was sold. So if we start seeing people losing their homes, then our budget gets a little shaky. Kempf: “What stands out to me of course is we’ve had a 33 percent increase in our property taxes, which tells us of course that we’re having housing value appreciations, which is nice for all of us who own homes here. I think, given the money that we’re leveraging, I think we’ve got a pretty poor investment return on the amount of money. I see the BID tax is up that’s being used for services, because we’re having a lot of tourists come to town, and they’re using that for services and a little bit for undergrounding. And if you notice parking, it’s inelastic, which means you keep raising the parking prices on the meters and they keep coming. And that’s good news for us. They want to come and they want to pay, we’ll just jack up the prices until they stop paying and then it’s elastic. Mathews: “I can’t make heads or tails of these numbers. And I don’t have an MBA from Harvard, but some things just don’t make sense. I don’t mind spending money, but I’ve got to tell you, I spent time with the Police Department and with the Fire Department, we all did, and these poor people, the fire people said ‘please just give us $15,000 so that we can get paramedics on these engines. We are sleeping on mats on the floor. Yes, a couple of our stations were retrofitted for earthquakes but that was back in 1981, so that they implode instead of explode.’ We’ve got to hire more cops. We’ve got to support our first responders. 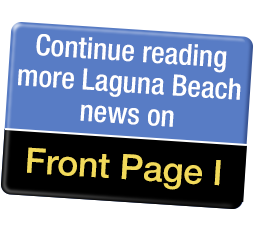 Merritt: “The City of Laguna Beach has a huge problem, and it hasn’t come because we’ve been lucky. North Carolina, Texas, hurricanes overseas, we see what we call the emergency. The Emergency Fund for Laguna Beach, according to our budget, is $6 million. Last year, the City Council only put in $60,000. That’s peanuts. Just wait until there’s a problem. You’ve got to have Council that has the foresight and can sacrifice in other area. We have 262 people that are employees in our city, approximately, and 342 are retired. Have you ever tried to run a business where more people are retired than are working? Dubin: “I’m going to talk to our cultural heritage and not just our historical heritage. The town was founded by artists; that’s true, we all know that. 300 out of 600 that lived here. Now we have 300 artists in a town of 23,000 and that’s the fault and misdirection of our City Council because we’re bleeding our creatives, and this city will be judged on how we treat our creatives that we’re not doing a very good job of that here. Editor’s note: responses have been abbreviated for space.